Herbsmith Rx Codonopsis Harmonize Qi maintains and supports a healthy immune system by tonifying the dog’s level of Qi. Herbsmith Codonopsis Harmonize Qi is a remarkably simple formula that allows an animal to maximize its own health. 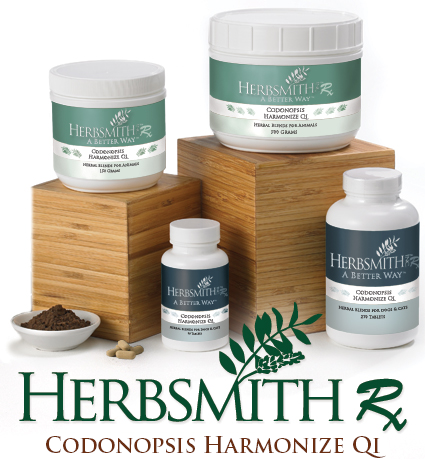 The individual herbs in Herbsmith Codonopsis Harmonize Qi have been shown to have numerous immune-supporting effects. By maintaining the animal’s overall level of immunity, these herbs assist the body’s innate ability to keep itself healthy. From a traditional Chinese perspective, Wei Qi (pronounced “way chee”), or the immune system, is considered to be the body’s defense. The root of all Qi in the body is the functioning of the stomach and spleen. The stomach breaks food down and the spleen absorbs and distributes the nutrients throughout the body and develops Qi. Bacteria and viruses are opportunistic in nature and may only invade an animal’s body because they can. Herbsmith Codonopsis Harmonize Qi is a combination of Qi tonics that supports the ability of the stomach and spleen to properly utilize nutrients, develop Qi and tonify blood. By maintaining these functions, Herbsmith Codonopsis Harmonize Qi promotes the overall level of Wei Qi, maintaining the body’s ability to keep itself healthy.